Ocimum sanctum, commonly referred to as holy basil, is an herb that is native to India; Ayurvedic medicine regards it as one of the most important plants. It is now widely grown throughout the world and can be eaten as a food or taken as a supplement. The leaves, stems, seeds and oils are all used medicinally.Many people with type 1 and type 2 diabetes use it to help lower high blood glucose levels. Diabetes is a disorder characterized by chronic high blood glucose levels. There are two categories of diabetes. Type 1 individuals are unable to produce the hormone insulin and are therefore dependant on insulin injections. Type 2 diabetics make insulin but they either do not make enough, or they are insensitive to it. Some researchers theorize that holy basil can help to increase insulin secretion in type 2 diabetics, says Laura Shane-Mcwhorter in the book "The American Diabetes Association: Guide to Herbs and Nutritional Supplements." Unfortunately there have not been enough rigorous studies to either confirm or disprove this theory. Holy basil may also help to lower fasting and post-meal blood glucose levels. There was a study done on 40 type 2 diabetics, who were asked to stop all of their diabetes medications. Half of the patients were given 2.5 g of holy basil leaf powder daily, and the other half were given a placebo for four weeks. The groups were closely monitored and at the end of the study, holy basil was found to reduce fasting blood glucose levels by approximately 17.6 percent, and post-meal blood glucose levels by 7.3 percent. The study was small, however, and more research needs to be done to confirm whether or not holy basil can effectively lower blood glucose levels. Cardiovascular disease is a common secondary condition in diabetics, and it is the leading cause of death in diabetic individuals. holy basil has antioxidant properties, which help to protect the body from damage, according to the Herbal Supplement Guide. This is important because free radicals are thought to contribute to cardiovascular disease, and antioxidants help to fight off free radicals. Studies have also found that holy basil has cholesterol-lowering properties and may reduce both total cholesterol and triglyceride levels. High cholesterol levels put a diabetic at a greater risk for developing cardiovascular issues such as hardened arteries and strokes. Holy basil may theoretically help to reduce that risk. 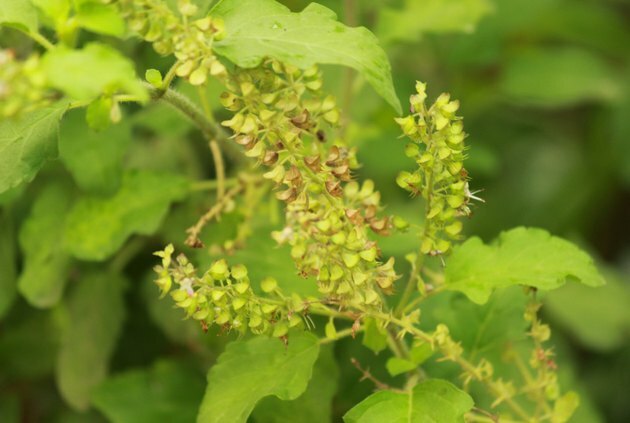 There is no typical dose for holy basil, but 2.5 g of dried leaf powder, used once daily on an empty stomach is what was used for the diabetes study. The verdict is however still out on whether or not holy basil is an effective treatment for diabetes. Shane-Mcwhorter says that there are no reported side effects or drug interactions with it but its usefulness is questionable. Also, it may in theory cause low blood glucose levels when combined with diabetic medications, or interact with certain sedatives. Consume holy basil only as a food product or under the recommendation of your health care practitioner, warns the American Diabetes Association. Is a High Dosage of Ginkgo Biloba Safe? What Are the Health Benefits of Agua de Jamaica?